Love it ! very well built and sturdy. The color is perfect. Constructed of 100-percent hardwood and not particle board, Water Creation prides itself on creating high-class vanities that are designed to last a lifetime. The marble countertop, ceramic sinks, and elegantly crafted doors and drawers all lend credence to the durability and superior craftsmanship. Countertop: All of Water Creation's vanities come with solid natural stone countertops that have been sealed at the factory to prevent staining and watermarks. The countertops are not made by sandwiching thin pieces of simple stone together, they are solid pieces of stone. Optional matching faucets and mirrors available. Dimensions 21.5 In. X 72.0 In. X 34.0 In. 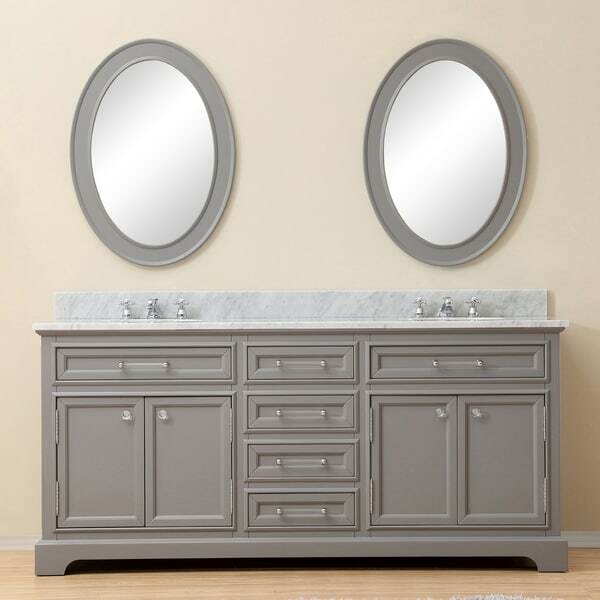 I was so pleased when I opened the box that contained my new Water Creation Derby 72-inch Cashmere Grey double sink bathroom vanity. I was nervous never having purchased such a large item on overstock before. The color was prettier than anticipated. The knobs tie in nicely with the cabinet itseld. The countertop is subtle and not overstated. The craftsmanship top-notch. Piece of advice - choose the delivery option that places it where it will be installed. It is heavy!! I needed to hire delivery people to move it to the second floor. Well worth the price I paid. This is gorgeous and made very well. Very heavy because the marble top is attached! "What is the size of the cabinet pulls? Distance between each screw?" There is 6 inches between the screws of the pulls. "Do the knobs come on the vanity or does it have predrilled holes? Can I order it without the knobs on?" The door knobs and pulls are all pre-assembled on the cabinet. "can we include or order mirrors and if so how"
Hello john, unfortunately this item is out of stock. We currently do not have inventory to check, and cannot guarantee the item will be restocked. We do have item 17344220. It is 60 inches and has the option of mirrors. Thank you for shopping with us. Will work perfect in my bathroom and a good price for the quality.